But that’s partly because the Detroit native uses his work to process events that have deep psychological resonance in his own life. Most notably, the painting “Ascension of the Troubadour” pays tribute to his musician brother, who passed away in 2006. The work includes the image of his brother’s wife, two daughters, and a skeleton in a tuxedo. It depicts their mother as an angel in a style that somehow combines Picasso (Fuhst’s favorite artist) and Tim Burton. The artist depicts himself as Hermann Hesse’s Steppenwolf in the piece. It’s not surprising that a literary figure has a presence in a highly personal artwork. Fuhst’s inspiration from the works of fantastical literature make their mark on many of these works to the extent that words make their way to the surface of some of the paintings. “Looney” quotes the “War is peace, freedom is slavery” line from George Orwell’s 1984, and Fuhst says it also refers to Franz Kafka’s short story “The Burrow.” Its figure howls at the moon not just in response to his straight-jacketed predicament but also seemingly over the painterly equivalent of hearing voices. “She Took Off Her Dress and the Sky Fell Down” quotes lyrics from a song by vocal group the Roches, as well as the Talking Heads’ “And She Was,” commingling narratives from the two songs with his image into a singular story. 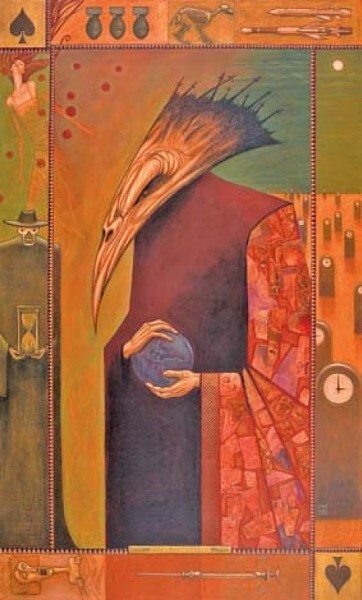 The most pronouncedly dark vision in these paintings is in “The Deathbird,” inspired by a Harlan Ellison short story. After the author’s mother died, he rewrote the Adam & Eve parable in which there’s only one human left on Earth, in addition to a guardian from an alien race, and God as the insane deathbird. Why does a story like that resonate with Fuhst? “It just clarifies to me how much confusion there is over religious interpretations,” explains the 46-year-old, whose family moved here during his childhood. “It’s always surprising to me how different you turn out when you aren’t raised with belief in a divine being, and all the expectations that creates,” he says about his agnostic background. Fuhst’s work has been seen locally at Kayo Gallery, 2nd Street, The Pickle Company and the now defunct Unknown Gallery, and previously at Contemporary Design & Art during its surrealism show, as well as in exhibits in New York City, Los Angeles and San Francisco and most recently at Los Angeles’ The Hive Gallery. The local mainstream outside the visual-art cognoscenti is warming up to his work, as well: He’s been invited to design a playbill for Pioneer Theatre Company and will be featured in the Pioneer Memorial Theatre’s Loge Gallery for Halloween 2010. The collaborative film Night of the Living Dead: Reanimated featured the work of Fuhst and other artists in recasting the 1968 horror movie classic. It‘s hard to say if he would have had those kind of assignments in Austin, Texas, where he lived for a while, but found the music hot spot surprisingly lacking in visual arts. His life here is the familiar story of a dominant belief system and those who live in that environment but don’t subscribe to it. “The underground is always more impassioned in a culture like that,” he maintains.